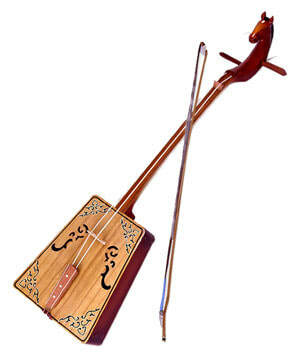 Matouqin, also known as the Morinhuur (horsehead two-string fiddle). On the Mongolian grasslands goes such a legend. A lord killed a white horse with his bow. The pet’s owner, named Suhe, was sorrowful and missed his pet day and night. One night the dead horse came into his dream, saying to him, “Make an instrument with my body. Then I can accompany you for ever and you will not fell lonely.” So the first type was made, with the horse hones as its neck, the horsehair as its strings, the horse skin covering its wooden soundbox, and its scroll carved into the shape of a horse head. 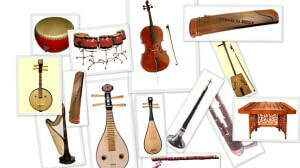 The instrument has quite a few other names both in Mongolian and in Chinese in different areas. Its use is beyond the Inner Mongolian region and can be seen in other Mongolian living areas such as northeast and northwest China and even in Xinjiang region. Deep and mellow in tone, the instrument, besides for solos, is used to accompany the singing of tales and folk songs.